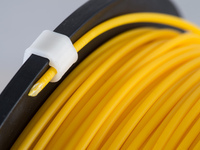 Minimalistic filament guide for Ender 3 by Rasmus33 is licensed under the Creative Commons - Attribution license. 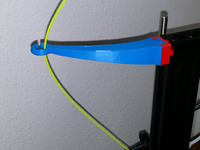 Small friction fit filament guide for Ender 3. 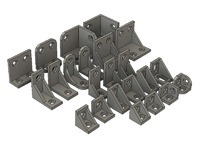 Requires two 10x4x3 (10od 3id 4mm wide) metric bearings and 15mm M3 screw or 3mm rod. Roller is printed in 2 parts for ease of fitting the bearings. I tapped the screwholes M3, so no need for nut. Say thanks by giving Rasmus33 a tip and help them continue to share amazing Things with the Thingiverse community. We're sure Rasmus33 would love a Tip, but unfortunately they have not setup their accounts to receive them yet.